This year at Google Cloud Next, the theme is all about supporting hybrid environments, so it shouldn’t come as a surprise that Apigee, the API company it bought in 2016 for $265 million, is also getting into the act. Today, Apigee announced the Beta of Apigee Hybrid, a new product designed for hybrid environments. As with Anthos, the company’s approach to hybrid management announced earlier today, the idea is to have a single way to manage your APIs no matter where you choose to run them. “With Apigee hybrid, you get a single, full-featured API management solution across all your environments, while giving you control over your APIs and the data they expose and ensuring a unified strategy across all APIs in your enterprise,” Zavery and Sridhar wrote in the blog post announcing the new approach. The announcement is part of an overall strategy by the company to support a customer’s approach to computing across a range environments, often referred to as hybrid cloud. In the Cloud Native world, the idea is to present a single fabric to manage your deployments, regardless of location. This appears to be an extension of that idea, which makes sense given that Google was the first company to develop and open source Kubernetes, which is at the forefront of containerization and Cloud Native computing. While this isn’t pure Cloud Native computing, it is keeping true to its ethos and it fits in the scope of Google Cloud’s approach to computing in general, especially as it is being defined at this year’s conference. It’s been about two years since Google acquired API management service Apigee. 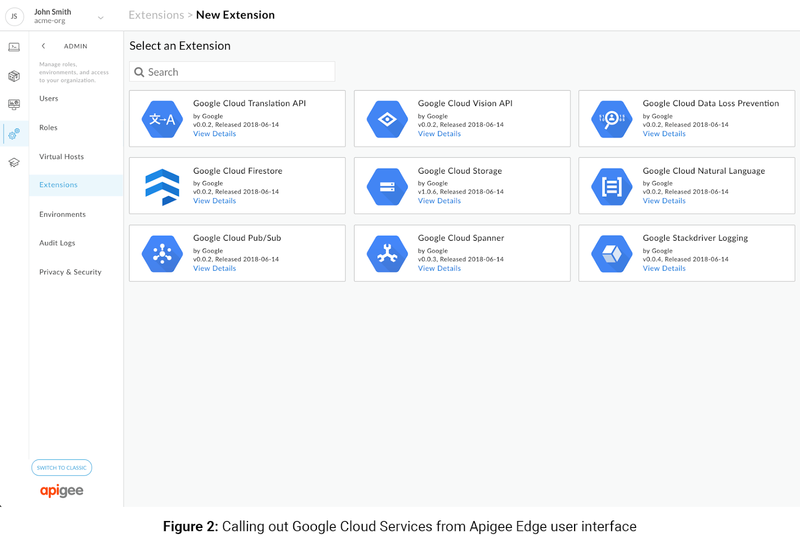 Today, the company is announcing new extensions that make it easier to integrate the service with a number of Google Cloud services, as well as the general availability of the company’s API monitoring solution. Anuff also told me that he believes that it’s still early days for enterprise API adoption — but that also means that Apigee is currently growing fast as enterprise developers now start adopting modern development techniques. “I think we’re actually still pretty early in enterprise adoption of APIs,” he said. “So what we’re seeing is a lot more customers going into full production usage of their APIs. A lot of what we had seen before was people using it for maybe an experiment or something that they were doing with a couple of partners.” He also attributed part of the recent growth to customers launching more mobile applications where APIs obviously form the backbone of much of the logic that drives those apps. API Monitoring was already available as a beta, but it’s now generally available to all Apigee customers. Given that it’s now owned by Google, it’s no surprise that Apigee is also launching deeper integrations with Google’s cloud services now — specifically services like BigQuery, Cloud Firestore, Pub/Sub, Cloud Storage and Spanner. Some Apigee customers are already using this to store every message passed through their APIs to create extensive logs, often for compliance reasons. Others use Cloud Firestore to personalize content delivery for their web users or to collect data from their APIs and then send that to BigQuery for analysis. Anuff stressed that Apigee remains just as open to third-party integrations as it always was. That is part of the core promise of APIs, after all. Google acquired API management service Apigee back in 2016, but it’s been pretty quiet around the service in recent years. Today, however, Apigee announced a number of smaller updates that introduce a few new integrations with the Google Cloud platform, as well as a major new partnership with cloud data management and integration firm Informatica that essentially makes Informatica the preferred integration partner for Google Cloud. Like most partnerships in this space, the deal with Informatica involves some co-selling and marketing agreements, but that really wouldn’t be all that interesting. What makes this deal stand out is that Google is actually baking some of Informatica’s tools right into the Google Cloud dashboard. This will allow Apigee users to use Informatica’s wide range of integrations with third-party enterprise applications while Informatica users will be able to publish their APIs through Apigee and have that service manage them for them. Some of Google’s competitors, including Microsoft, have built their own integration services. As Google Cloud director of product management Ed Anuff told me, that wasn’t really on Google’s road map. “It takes a lot of know-how to build a rich catalog of connectors,” he said. “You could go and build an integration platform but if you don’t have that, you can’t address your customer’s needs.” Instead, Google went to look for a partner who already has this large catalog and plenty of credibility in the enterprise space. Apigee, a company that helps organizations build and manage API connectors, went public this morning at $17 per share, briefly jumping to $20 per share before closing at $16.68, down 1.88 percent in its first day of regular trading. After-hours, the company is flat.